I haven’t had many issues with food cravings thus far during my pregnancy. Actually, about the only thing I’ve craved thus far, aside from grapefruit, is macaroni and cheese. The problem was that August and September were too warm to be baking homemade mac and cheese, not to mention my continual exhaustion. So my craving turned to Stouffer’s mac and cheese, even though it took about 2 months before I actually got to have any, and by that time, I didn’t want it so much anymore. Shortly before my birthday in October, we came home for lunch and I decided to make some saucepan mac and cheese for a change. I started with a basic recipe in my old Better Homes and Gardens cookbook since it was at hand, and gussied it up with prosciutto and peas and garlicky breadcrumbs to make it a little more interesting. Jeremy was ambivalent about the whole thing, but he changed his tune once he tried it. I believe his exact comment was, “This is really good. It’s my favorite mac and cheese. I love you.” Ever since, hardly a week goes by without a request for mac and cheese, and I’ve given in and made it twice more in the past month. Apparently Jeremy is having sympathy cravings. 🙂 Since it was our lunch again today, it seemed high time to share the recipe here. You can use whatever cheese or combination of cheeses you have on hand. Our favorite blend is sharp Cheddar for bite, Gruyere for nuttiness, and Fontina for creaminess, but experimenting is always good. In a large pot, boil water and cook elbows according to package directions. In the last minute or two, add the frozen peas. Drain, and set aside. In a large saucepan, melt butter over medium high heat. Add onions with a pinch of salt and saute until translucent; add prosciutto and cook until browning. Turn heat down to medium, stir in flour, and cook for another minute or two. Add milk and stir well; bring to a simmer. Meanwhile, coarsely chop or grate cheeses, stirring milk mixture periodically as it thickens. Add cheeses, mustard and Worcestershire sauce. Taste sauce and correct seasonings. When sauce is thickened and cheese is melted, add pasta and peas. Turn heat to low and continue cooking for several minutes to meld flavors. Meanwhile, melt remaining T of butter in a small skillet over medium heat. Add minced garlic and cook until fragrant and golden brown. Add bread crumbs and seasonings to taste, stirring to combine and coat with butter. Turn up the heat to medium high, and allow to cook until the bread crumbs begin to brown and crisp, turning frequently; remove from heat. 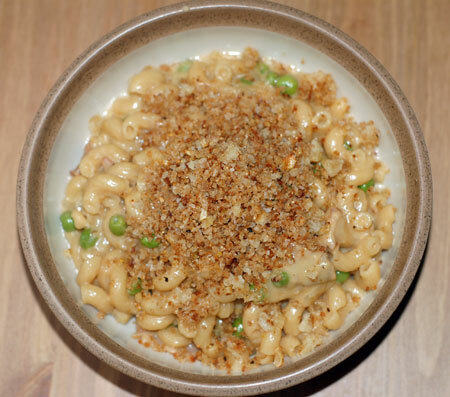 To serve, scoop mac and cheese into bowls and top with a generous sprinkle of bread crumbs (and more cheese if you like). This recipe can be doubled using half a pound of elbows. Pour it into a casserole large enough to fit and bake in a 350F oven for 20 minutes, or until bubbly. 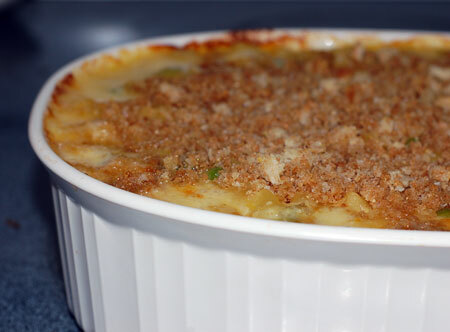 Cover top with prepared bread crumbs and bake for another 5 minutes or so to crisp up.